The Institute of Transportation Engineers (ITE) has established a mobility-as-a-service (MaaS) initiative to raise awareness of new and emerging issues/technologies. “The proliferation of ride-hailing, bike-sharing, and most recently electric scooters has expanded the availability of transportation choices and is addressing some of the first- and last-mile issues that exist with traditional transit. They have the potential to affect housing and car-ownership decisions and can provide new travel options for the young, the old, and the disabled,” says an article about the initiative. 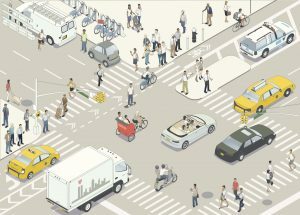 It goes on to elaborate about challenges, such as curb-space demand, safety concerns, congestion, and accessibility concerns, that come with increased shared-mobility options, right alongside the pluses.